talkhealth > Blog > 2015/04 > Win a Nairns oakcake tin AND some oatcakes! Allergy Awareness Week just keeps on getting better and better. 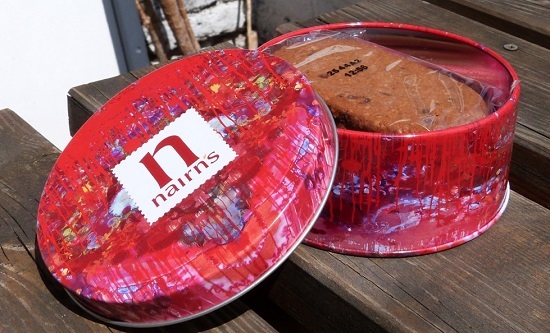 Today you have the chance to win yourself one of the new Nairns oakcake tins so you’ll never find a dead one crumbled in the bottom of your bag ever again. Always a sad way for a humble oat cake to go; ignored, lost and disintegrated into a pile of stale crumbs. Much better nice and crisp and inside your tummy. They are the perfect size for the new packs of finger shaped oatcakes, one and half packs of the normal sized oat cakes or a couple of packs of Muesli Breaks. All you have to do to get yourself one of these beautiful little tins and some delicious gluten and/or wheat free oatcakes is comment below. Tell us why you’d like one and what you’ll be keeping in yours. There will be more than one tin to win so don’t hold back. Nairns are sending me a shipment of them (not sure how many but don’t get too excited…) so get in there quick. This competition will be awarded on a strictly first come, first served basis. 4 Responses to Win a Nairns oakcake tin AND some oatcakes! the museli oatcackes look so yummy and their tin would be useful when I buy some more! I’d love one of these for our camper (space and weight are at a premium). Not too big and lovely to have some oatcakes on the road.